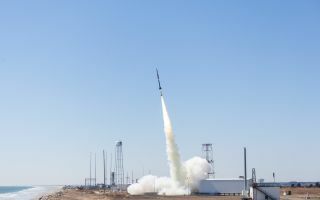 A NASA Black Brant IX sounding rocket carrying the Advanced Supersonic Parachute Inflation Research Experiment or ASPIRE launches from the agency's Wallops Flight Facility on Wallops Island, Virginia on March 31, 2018. A supersonic parachute designed to land future NASA spacecraft on Mars just underwent a key test high up in Earth's skies. The Advanced Supersonic Parachute Inflation Research Experiment (ASPIRE) launched atop a sounding rocket Saturday (March 31) from NASA's Wallops Flight Facility in Virginia at 12:19 p.m. EDT (1619 GMT). The successful launch came after several days of delays due to rough seas at the parachute's recovery zone in the Atlantic Ocean. The test was meant to mimic the conditions that a spacecraft would experience during a Red Planet entry, descent and landing (EDL). The Martian atmosphere is just 1 percent as dense as that of Earth, which is why ASPIRE went so high up, where our air is thin. Shortly after liftoff, ASPIRE splashed down in the Atlantic Ocean off Virginia, where it will be retrieved by boat. Analysis of the recovered chute and its rigging, as well as data gathered during the flight by cameras and other instruments, will help researchers complete the design of the chute for NASA's 2020 Mars rover, NASA officials have said. As its name suggests, that rover is scheduled to launch two years from now, on a mission to hunt for signs of ancient life on the Red Planet. The six-wheeled vehicle, whose body is based heavily on NASA's Curiosity Mars rover, will study rocks on site and cache samples for eventual return to Earth (though no mission to bring these samples home is currently on NASA's books). The 2020 rover will employ the same broad EDL strategy employed by Curiosity, which slowed its descent through the Martian air using a supersonic chute and was lowered to the red dirt on cables by a rocket-powered "sky crane." Today's flight was originally scheduled for Tuesday (March 27) but was postponed because seas were predicted to be rough on that day, complicating parachute-recovery operations. ASPIRE now has two test flights under its belt. The first one occurred in October 2017, also aboard a Terrier-Black Brant IX that launched from Wallops. On that earlier occasion, the chute unfurled at an altitude of 26 miles (42 km), while ASPIRE was traveling at 1.8 times the speed of sound, NASA officials have said.